Magazines and books have had beautiful Fall displays on porches, tables, front doors, kitchen islands, coffee tables, mantels, and chests of drawers for decades. Now catalogs, websites, blogs, videos, HGTV, e-magazines, Facebook, Instagram, Pinterest, etc... have joined the decorating party and show beautiful lavish displays even more gorgeous than magazines from a decade ago. With so much inspiration, you may find yourself like me, wanting similar displays in your home, but not exactly sure about how to achieve them. And, how to do it on a realistic household budget. 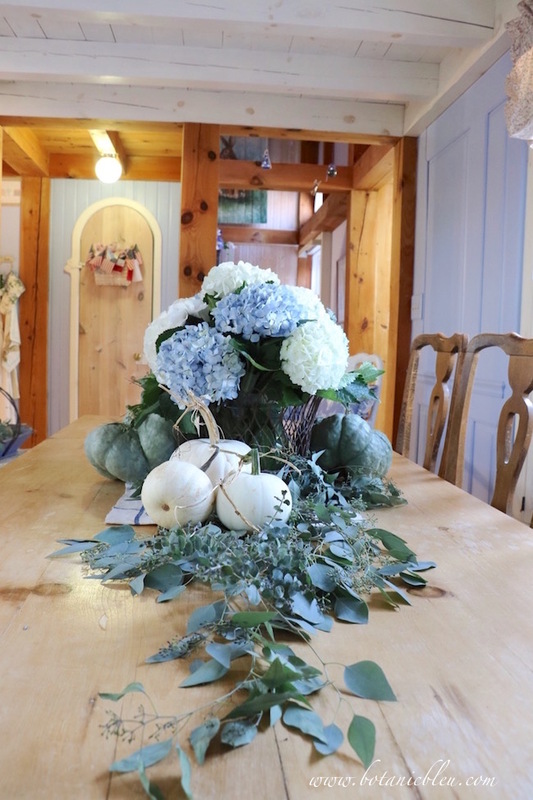 How do you create a beautiful Fall display? What goes into choosing materials, preparing plants and flowers, creating a design, and keeping costs reasonable? Through experience, research, reading tips from others, and studying floral designs in media, I've collected a few ideas about how to create my own garden and house displays. You probably know many of my tips already, but you may find some new ideas. 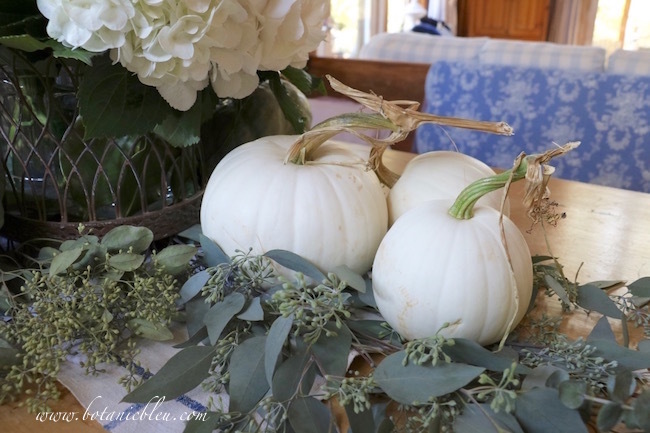 Here are my tips for creating beautiful Fall displays in your home. Look to your own home to decide what colors and styles to use. Choose colors you use in your home everyday or that will coordinate with your home's everyday look. Fall does not have to orange, red, or yellow, but it can be. Use containers you already have. Soup tureens, baskets, boxes, bowls, and platters you already own will go with your home's colors, will not cost anything, and will coordinate with your home's decor style. The French-style wire basket is a go-to container in my French Country home. Stacks of folded kitchen towels, Fall pansy bedding plants, fresh Christmas greens with Sugar pinecones, and fresh fruit are ways this little beauty has been used beside holding hydrangeas. 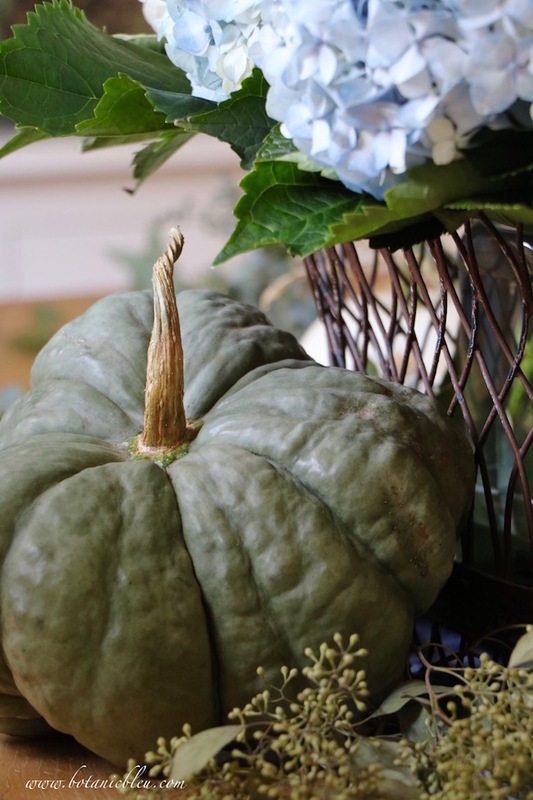 Choose large flowers or plants like pumpkins to be the focal point of your display. Fill in with other live flowers and plants from your yard, from a neighbor's farm, or with faux flowers and plants from discount stores. Buy your pumpkins as soon as they become available. Pumpkins sitting in a nursery are exposed to weather conditions. They may be sitting in the hot sun or in puddles of rain water. Getting your pumpkins early means you can store them at home to protect them until you use them. Buying early means better selections. 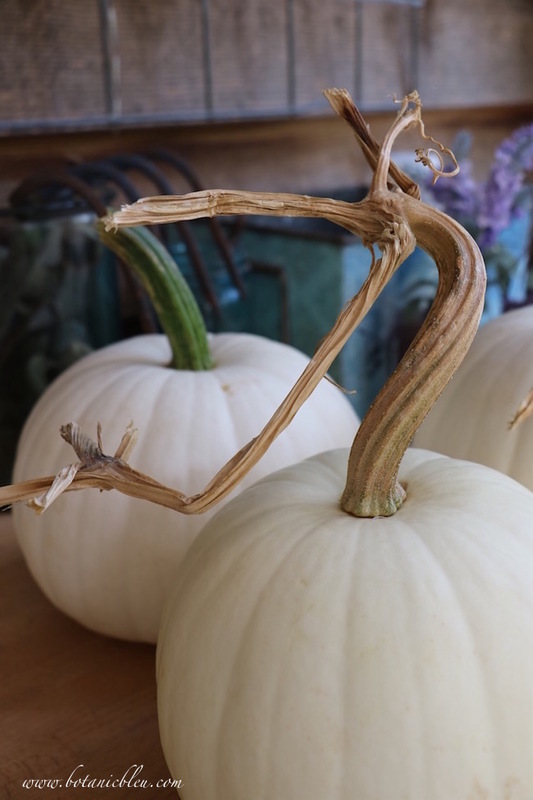 You can find the pumpkins with the best twisted stems, the best colors, the best shapes. The longer a pumpkin is at the nursery, the more likely the pumpkin will be dropped, and the more likely the stem will be broken off. Bruised pumpkins will rot quicker. Who wants a pumpkin without its fairytale twisty stem? Me, either. Shop on a week day, not the weekend. Beat the crowd by shopping during the first week before the weekend. Compare all of the pumpkin varieties available in your area. Different varieties, even in the same colors, cost different amounts. My SECRET cost-saver tip about my green pumpkins... Buy squashes instead of pumpkins. 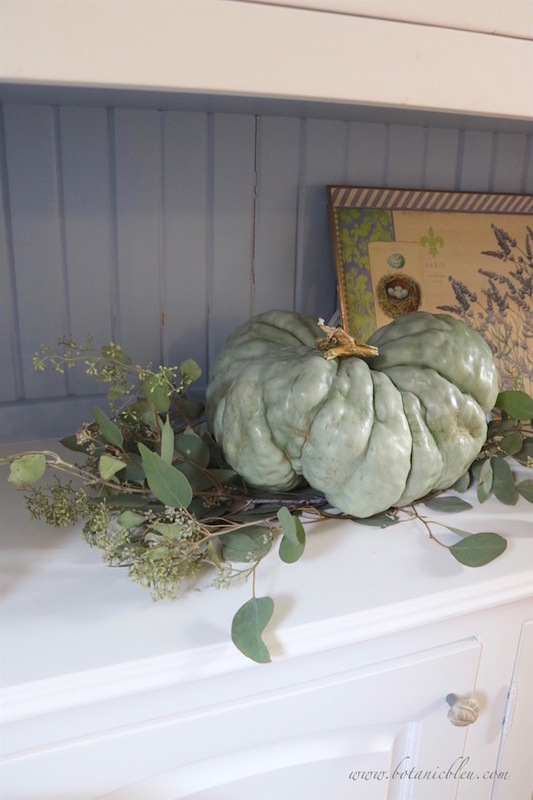 All of the green pumpkins in my Fall arrangements are really squashes, not pumpkins. The local upscale nursery had both green pumpkins and these green squashes in the same general shapes and sizes. But, the green squash cost only a little more than HALF the cost of the green pumpkin. Since I am not cooking with these, squashes worked just as well as pumpkins. 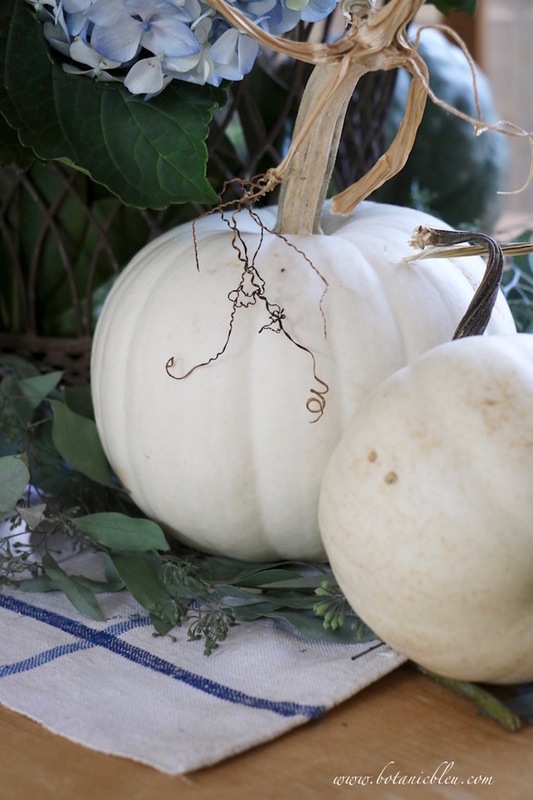 All of my white pumpkins are a new variety at the upscale nursery this Fall and are the least expensive variety of white pumpkins the store offered. True, these white pumpkins are smaller than the more expensive white pumpkins, but they are bigger than the Baby Boo-Boos. 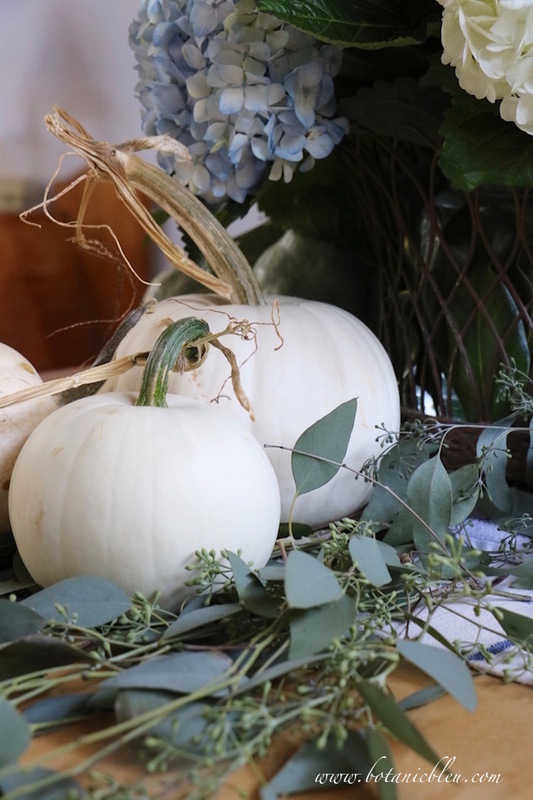 Since I bought these pumpkins the first week (not the weekend) they were available, I got to pick all of the biggest ones with the cutest stems to buy... at a fraction of the cost of the bigger, well-known white pumpkin varieties. 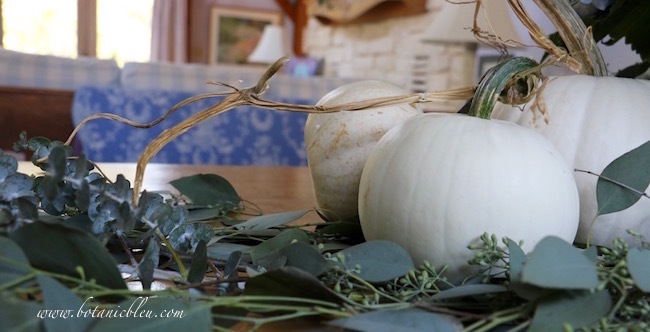 Grapevine and bittersweet are not the only natural vining plants for Fall decorating. Any vine in your yard can be used. Honeysuckle, fall blooming jasmine, clematis, and ivy are a few common vines. Strip the leaves from any of these plants to create bare vines for wreath bases or for wreaths around pumpkins. Bradford pear trees do not form mature pears for eating. Instead, small seed pods form. Any place seeded eucalyptus can be used, Bradford pear tree branches with their leaves and small seed pods can also be used. Keep fresh flowers in water, inside the house, out of the sun, until ready to use them. As soon as you get home with them, trim their stem bases and put them in water. Wash your pumpkins as soon as you can. Caked-on dirt spots are the places where a pumpkin rots first. 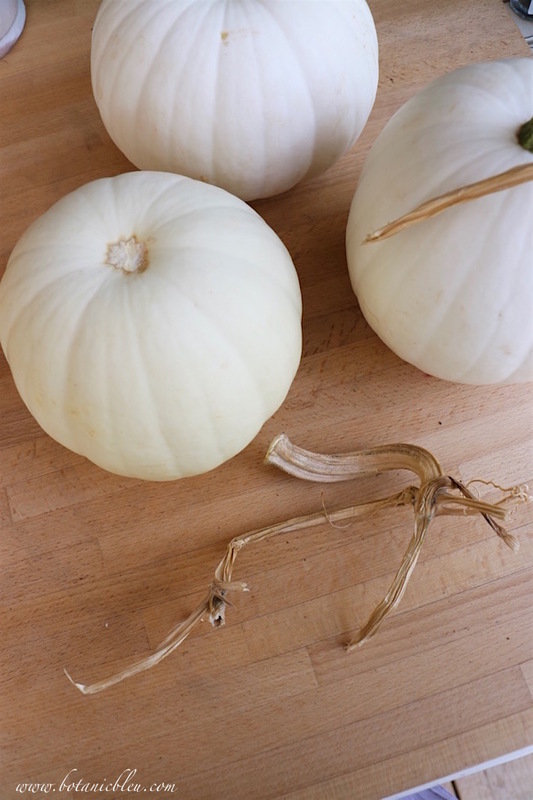 Repair broken off pumpkin stems by re-gluing them to the pumpkins. Use a hot glue gun to apply a small dab of glue to the stem well at the top of the pumpkin. With just a few seconds pressure, the stem will hold. Repaired stem ready for display... Dried stems are the ones susceptible to being broken off. Green stems are less likely to break. 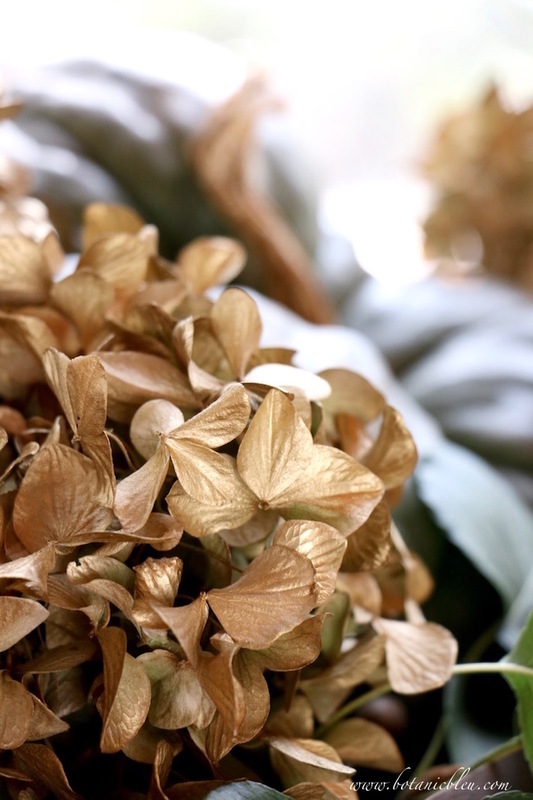 Revitalize dried hydrangea blooms with spray paint. I have sprayed dried hydrangeas pale blue, white, and this fall, gold. 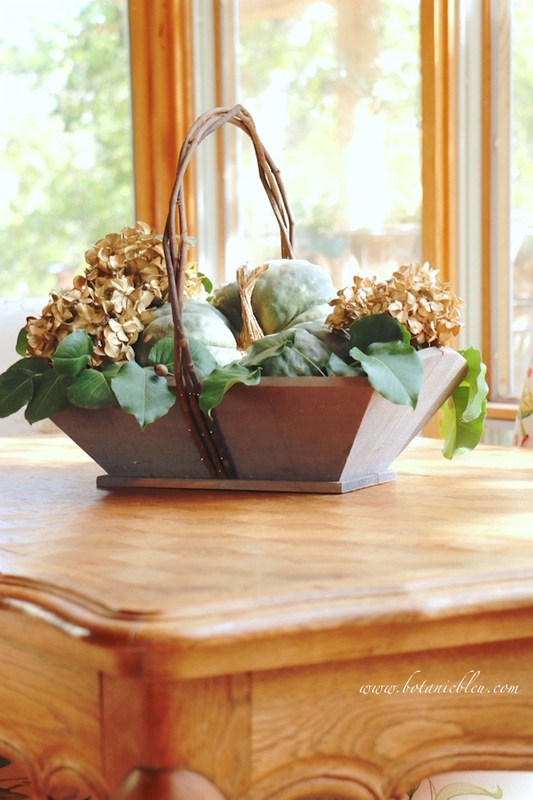 Gold adds a touch of a traditional Fall color to the green pumpkin and pear tree branches. Begin with a runner with the hydrangeas placed in the center. Place a white terry cloth dish towel on top of the runner, but underneath the hydrangeas. This will provide extra protection to the table from possible water drips from the flowers and will be hidden by the greenery and pumpkins. 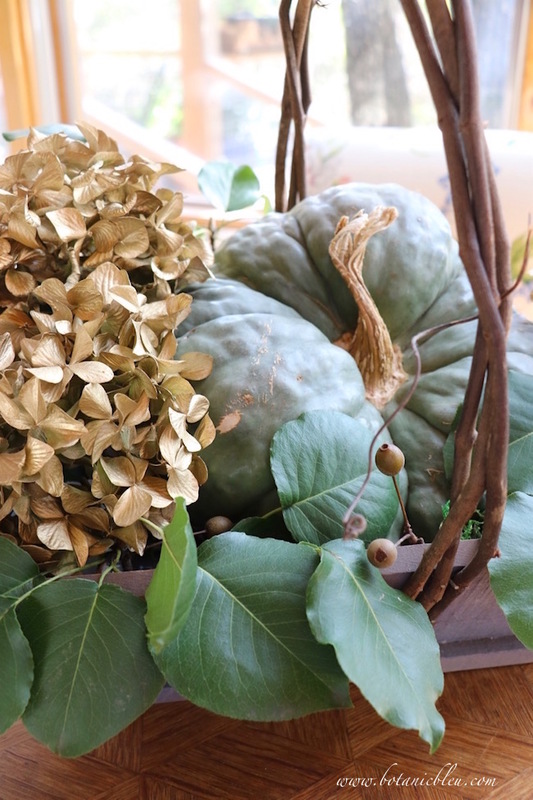 Place a large pumpkin/squash centrally beneath the hydrangea arrangement on both front and back to visually anchor the flowers. 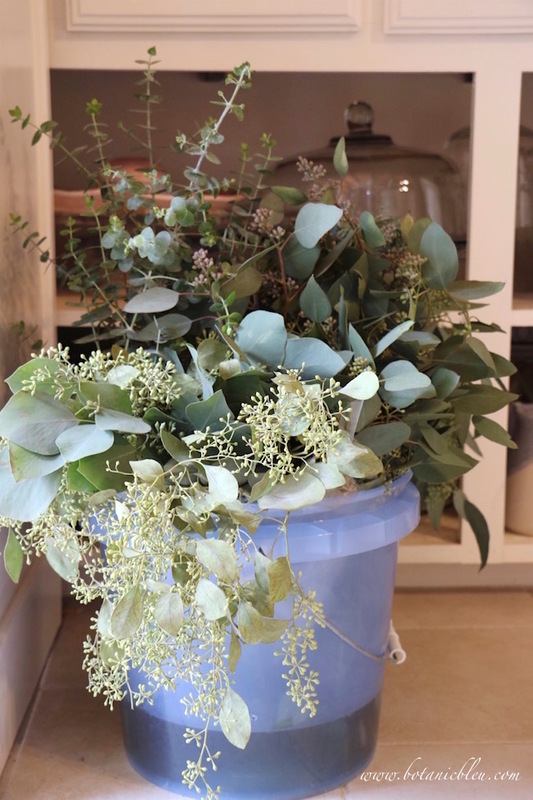 Add stems of seeded eucalyptus to either side of the hydrangeas. 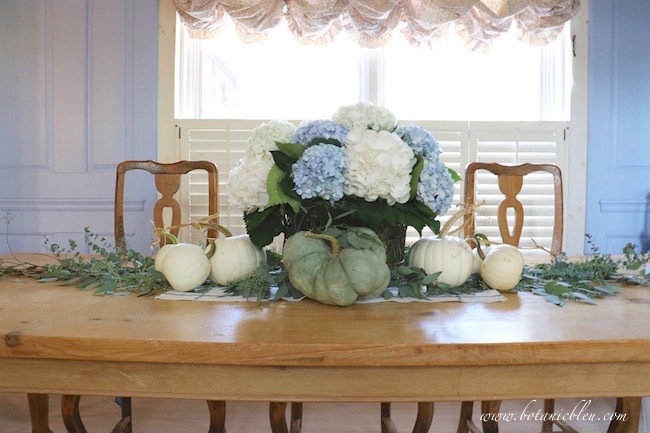 Use enough stems on one side to fill the width of the table runner. Then gradually reduce the width of the eucalyptus to a single stem with seeds at the end. Insert a couple of rounded leaf eucalyptus with their stems sticking up into the air. Place a cluster of three white smaller pumpkins on each side of the hydrangeas. Turn the pumpkins so the two stems face away from the hydrangeas. The third pumpkin should be at a different angle, leaning onto the other pumpkins. 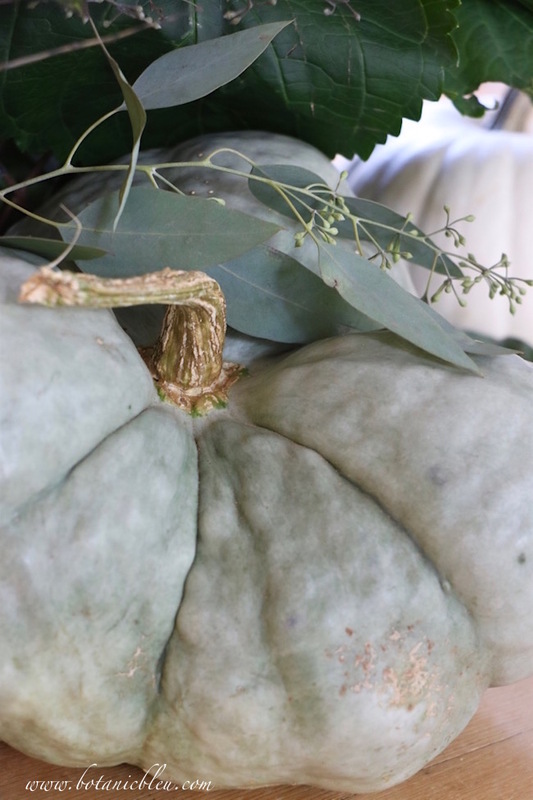 For pumpkins with LONG stems, align the long stems with the center of the eucalyptus stems. If a pumpkin continues to roll out of position, place a short stick underneath it to hold it in place to keep it from rolling. 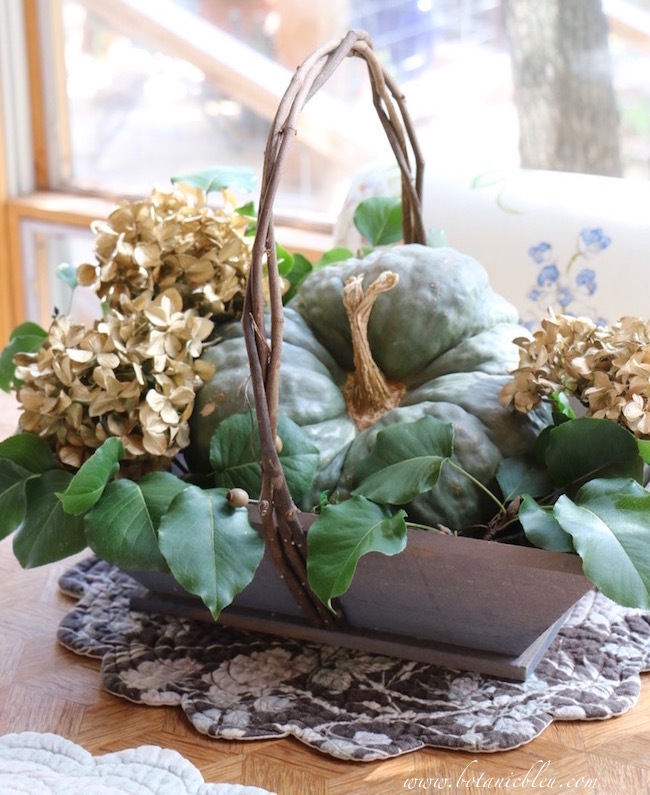 Placed in a rustic basket with Bradford pear stems and gold spray-painted dried hydrangeas... Remember to protect the table with a Fall placemat. 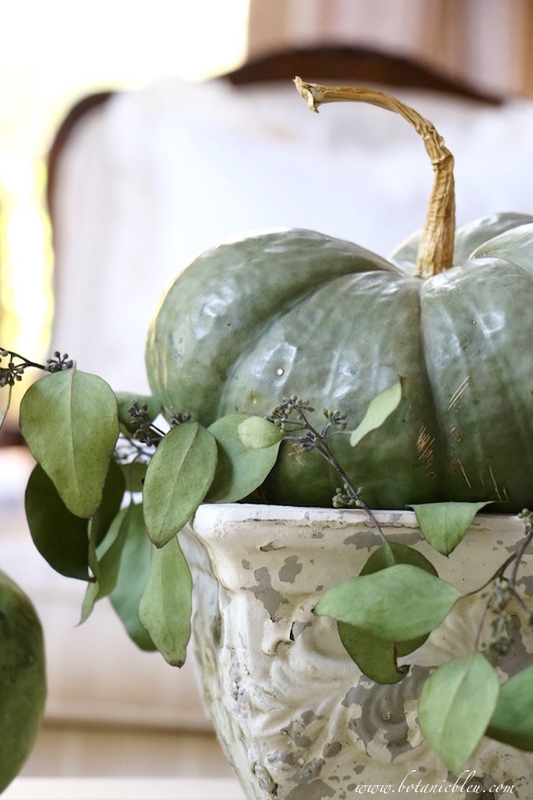 For Fall inspiration of all kinds, see my Pinterest board, FALL . Today is the third day for the Fall in Love With Texas Blog Tour. With all the diversity and beauty offered by these posts, you are sure to find Fall inspiration that fits your style. Love it! What is particularly special to me, is the fact that you use readily available pumpkins, vines, flowers, containers etc. that we probably already have. Thanks for give me some great ideas. Thank you. When I am drooling over flower arrangements in magazines and blogs, I always wish I could afford to make something like it. I find myself counting the number of hydrangea blooms or the number of pumpkins (porch steps) to calculate the costs. 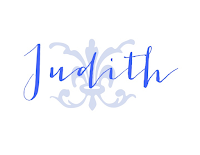 Lavish arrangements can get expensive unless you have a source for reasonably priced items or a source for free items... like your backyard, garden patch, or a neighbor's generosity. What an absolutely stunning post full of inspiration! 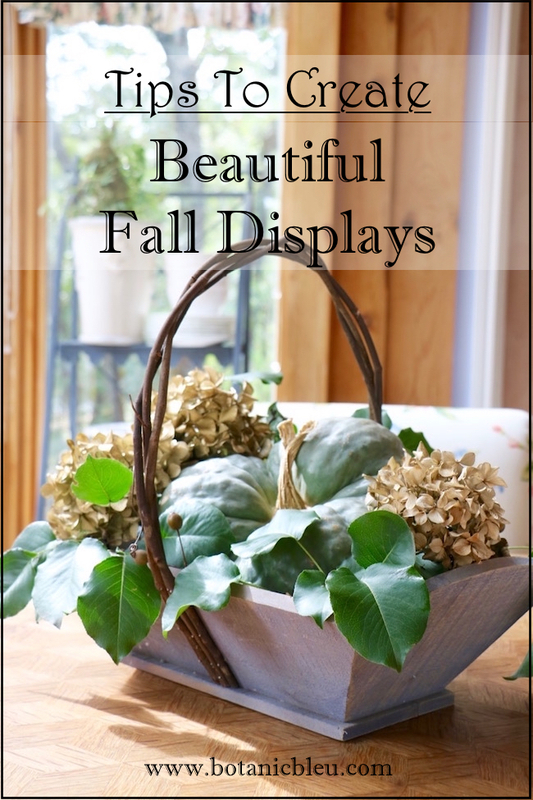 Thank you for these helpful tips and your fall displays are beautiful! 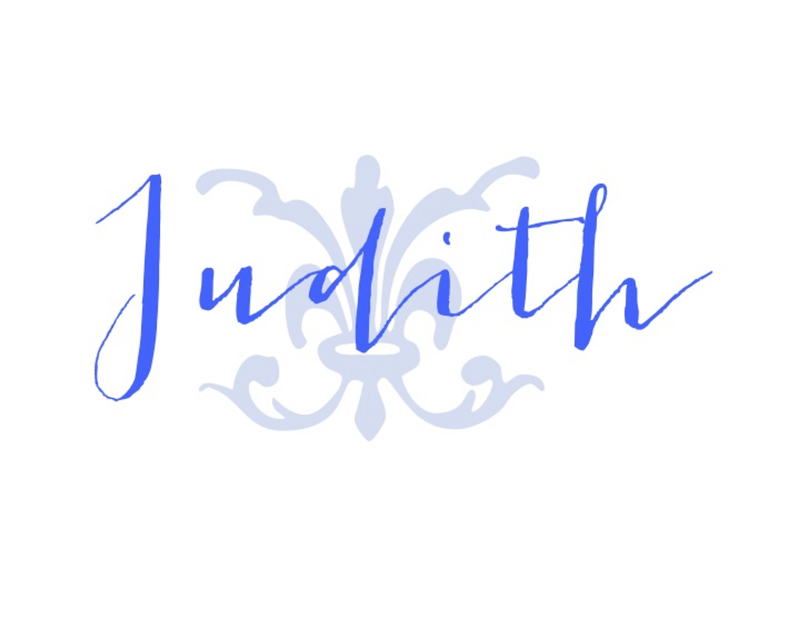 Thank you, Judith for all the inspiring ideas for Fall displays! !